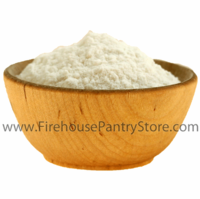 Vinegar powder is used to add tartness to seasonings, rubs, marinades, barbecue sauces, salad dressings, and dry mixes. Mix with salt to make a seasoning for French fries, homemade chips, roasted potatoes, and steamed vegetables. Stores and travels well - great for emergency food supplies, camping, boating, and RVing. Volume: 1 pound equals approx. 4.17 cups. Reconstitution Ratio: 1 part Vinegar Powder to 1.5 parts Water (by weight). Ingredients: maltodextrin, apple cider vinegar, modified food starch. Packaged in a facility that packages wheat, milk, soy, egg, peanuts, and tree nuts.